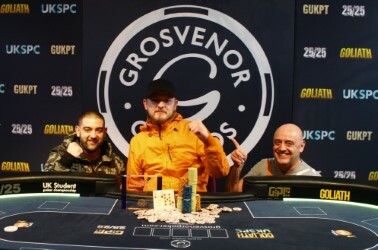 Until recently Nathan was relatively unknown on the UK poker scene but after a 5th place finish in the 25/25 Blackpool, a win at the Blackpool Deepstack and now with a GUKPT title under his belt, Nathan has firmly established himself as one to watch. GUKPT Edinburgh welcomed an incredible 309 entries, an increase of 51 from last year’s Main Event. Grosvenor Casino Maybury Edinburgh certainly played its part in the increase in numbers. A huge 67 players qualified from the extensive satellite offering leading up to the festival week in the casino. One such qualifier was Michelle Baldie who came desperately close to becoming the first ever female GUKPT champion, a milestone yet to be accomplished in the GUKPT’s 12 year history. GUKPT now takes a small pre-summer break before the Luton leg in June. In the meantime focus now turns to the annual Easter Beast as well as Grosvenor Casinos’ U.K. Student Poker Championship (UKSPC).